Our entire team is dedicated to making sure you are highly satisfied with every aspect of your project. We want you to be satisfied with the design of your home, the quality of construction, the end result, and the experience you have working with us. We retain the leading homeowner satisfaction rating company in the remodeling and home building industry to survey our clients. 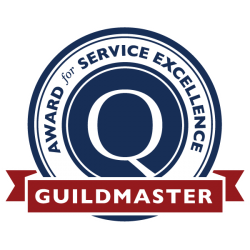 The company, GuildQuality, provides us third party verification of how well we are meeting your expectations. It also helps us learn if we need to do better in any area. A 2011 industry survey* of homeowner satisfaction with remodelers nationwide showed only 62% of homeowners surveyed who would recommend the remodeler they used. Allida B. and Judy B. In life, you get what you pay for. If you want a job done right the first time and want an extremely skilled and responsive team of professional craftsmen, Merrill is worth every penny. Christopher D. and Terry M.
Paul H. and Melinda S.
Everyone we worked with was professional and courteous. They were kind to our kids and our dog, and we could trust them completely. Our lead carpenter, Jeremy, cared as much about the project as we did, sometimes more. The Merrill experience was so smooth. We had no issues with the Merrill people. They made sure that they understood what we wanted and delivered more than we expected. Our lead carpenter made sure that every part of our project was done first rate. The Merrill team was always open with us and responsive to our needs. Work done on your house while you are living in it is obtrusive, but the Merrill team made it as easy as possible. Our lead carpenter and project manager looked out for our interests every step of the way. Dr. and Mrs. Thomas M.
We would recommend Merrill to anyone who wants an unbelievably professional and skilled team to work on their project. The Merrill people are honest, trustworthy and innovative. They figure out how to deliver what you want. They never take short cuts. Francisco M. and Lisa M.